Participants in the 6th Brethren World Assembly visit after registering for the event. The Sixth Brethren World Assembly is set to begin this afternoon at the Winona Lake, Ind., Grace Brethren Church (Bruce Barlow, lead pastor). 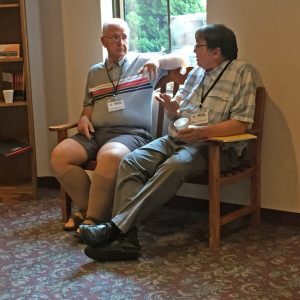 Focusing on the theme “Brethren Intersections: History, Identity, Crosscurrents,” the four-day event happens every five years for Brethren groups descended from Alexander Mack in 1708. It is sponsored by the Brethren Encyclopedia Project, Inc. Assembly sessions are open to all and will feature lectures, panel discussions, historical tours, worship services, and much more. Today’s session begins at 2 p.m. with a plenary session focusing on historical and religious intersections for the Brethren. It concludes with a worship service, where Dr. Gary Kochheiser is the speaker, and an ice cream social. Friday includes sessions that focus on the Brethren-evangelical relationship in the eras of Charles G. Finney, Billy Sunday, and Billy Graham. Afternoon panels and sessions include a discussion of the Brethren and the Civil War, “What’s in a Name?,” responses to war, the life and ministry of Jacob Cassel, and clean water as a catalyst for Christian-Muslim reconciliation. An optional bus tour will take guests to sites in and around historic Winona Lake, once the home of the world’s largest Bible conference, and a central conference point for Brethren groups since the 1880s. Saturday’s sessions will focus on themes of social justice, relationship with the military, gender questions, and will include a bus tour of historic Brethren sites at Arnold’s Grove in Milford, Ind., and Camp Alexander Mack on Lake Waubee. The day concludes with a worship service at the New Paris, Ind., Church of the Brethren. On Sunday attendees are encouraged to worship with local Brethren congregations, not of their own groups. Evening sessions are open to the public at no charge. Walk-in registration for events during the day is available. The event is chaired by Terry White, a member of the Brethren Encylopedia Board representing the Charis Fellowship. Jared Burkholder, history faculty member at Grace College, is the program chair.